INDIANAPOLIS — Two million of the five million Americans admitted to intensive care units annually have or develop acute respiratory failure, predisposing them to long-term cognitive, functional and psychological impairments collectively known as post-intensive care syndrome. A new $3.2 million grant from the National Heart, Lung, and Blood Institute funds the development and evaluation of the novel mobile Critical Care Recovery Program by the Indiana University Center for Aging Research. 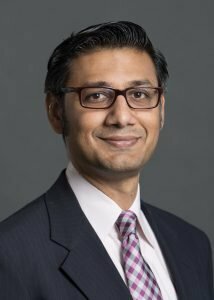 “Although there are certainly some community resources and rehabilitation services available to ICU survivors, these are fragmented and difficult for the post-ICU patient and family to access, typically making a meaningful recovery unattainable,” said IU Center for Aging Research and Regenstrief Institute investigator Babar A. Khan, MD, principal investigator on the new five-year study. “m-CCRP, our patient-centric mobile Critical Care Recovery Program, brings post-ICU care right to the ARF–acute respiratory failure–patient in their home and works together with patients and caregivers to improve both quality of life and brain health, decreasing the likelihood of rehospitalization. “When we talk about rehospitalization, we shouldn’t forget how the patient and how the family feel about it. Decreasing the likelihood of rehospitalization is not just about health care costs, it’s about people and their lives.” Dr. Khan is a critical care medicine physician and an implementation scientist with the IU Center for Health Innovation and Implementation Science. The m-CCRP aims to improve the recovery of acute respiratory failure survivors utilizing a mobile care coordinator. The NIH-funded randomized controlled trial will evaluate the success of m-CCRP in improving the health-related quality of life as well as the cognitive, physical and psychological functioning of ARF survivors. Dr. Khan and colleagues will also determine if m-CCRP reduces future health care utilization by ICU survivors. Each m-CCRP patient and family will be followed for 12 months, significantly longer than previous studies of ICU survivors, according to Dr. Khan. During that year the mobile care coordinator, who is available as needed, will visit ICU survivors biweekly and be supported by a multi-disciplinary team composed of an ICU physician, a geriatrician, a neuropsychologist, and an ICU symptom management nurse. This team will meet on a weekly basis to develop and continually revise a personalized recovery plan incorporating patient and caregiver goals. m-CCRP builds upon Dr. Khan’s experience in developing the successful Eskenazi Health Critical Care Recovery Center with support from the National Institute on Aging and Eskenazi Health. The innovative prototype outpatient clinic was the nation’s first collaborative care concept focusing on the extensive cognitive, physical and psychological recovery needs of intensive care unit survivors who are seen in the center after hospital or rehabilitation facility discharge. Co-investigators of NHLBI grant R01HL131730-01A1 are Regenstrief Institute investigator Malaz Boustani, MD, MPH, founder of the IU Center for Health Innovation and Implementation Science and associate director of the IU Center for Aging Research; Frederick Unverzagt, PhD and Sujuan Gao, PhD, of the IU School of Medicine and Sue Lasiter, PhD, RN, formerly with the IU School of Nursing and now with the University of Missouri-Kansas City School of Nursing and Health Studies.